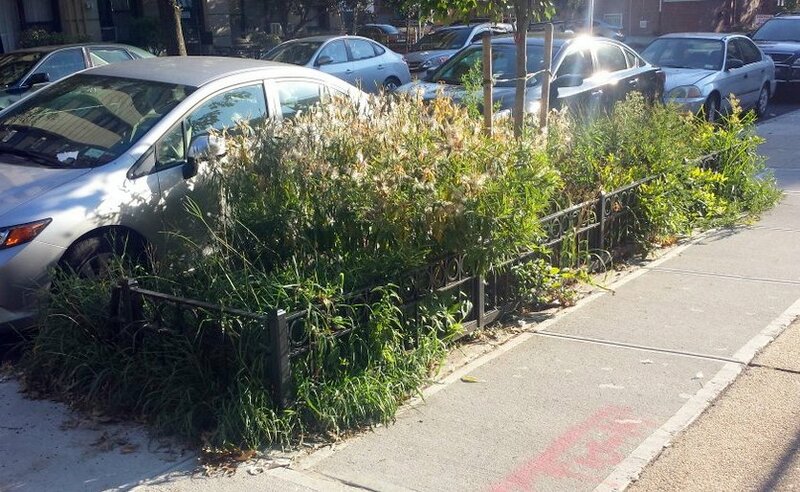 An enhanced tree pit in Rego Park (Queens), NYC. The layers of permeable material beneath the surface, and the native plants, filter storm water and slow it down so it doesn’t overwhelm the sewer system. 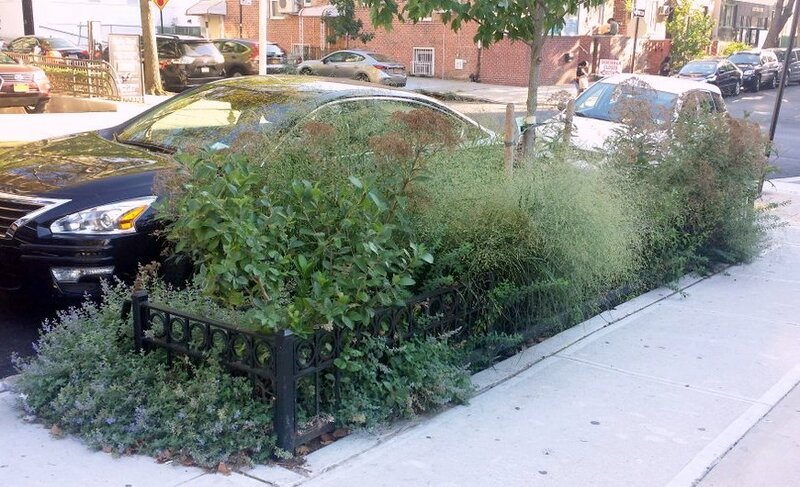 My mother’s neighborhood in Queens has many enhanced tree pits, one of several techniques NYC uses to help prevent stormwater from overwhelming an ancient and inadequate sewer system. This one, and another just half a block away, are planted with a nice variety of trees, shrubs, perennials, and grasses, mostly native. There are red maple, black chokeberry, a joe pye weed, a grass that was hard to identify but I believe is prairie dropseed, and a milkweed, in addition to some nonnatives like catmint, and some weeds. The chokeberries were full of fruit. Maybe the city birds don’t recognize the fruits. The Bergen County birds eat mine the second they ripen. The milkweed was full of ripe seeds. Maybe they’ll land in nearby parks and backyards. This enhanced tree pit holds milkweed with ripe pods, in additional to numerous other native plants. This website and video explain how to construct enhanced tree pits as well as some other stormwater-management devices. Wouldn’t these be great here in Bergen County, where we certainly have aging and inadequate sewers and a stormwater management problem? 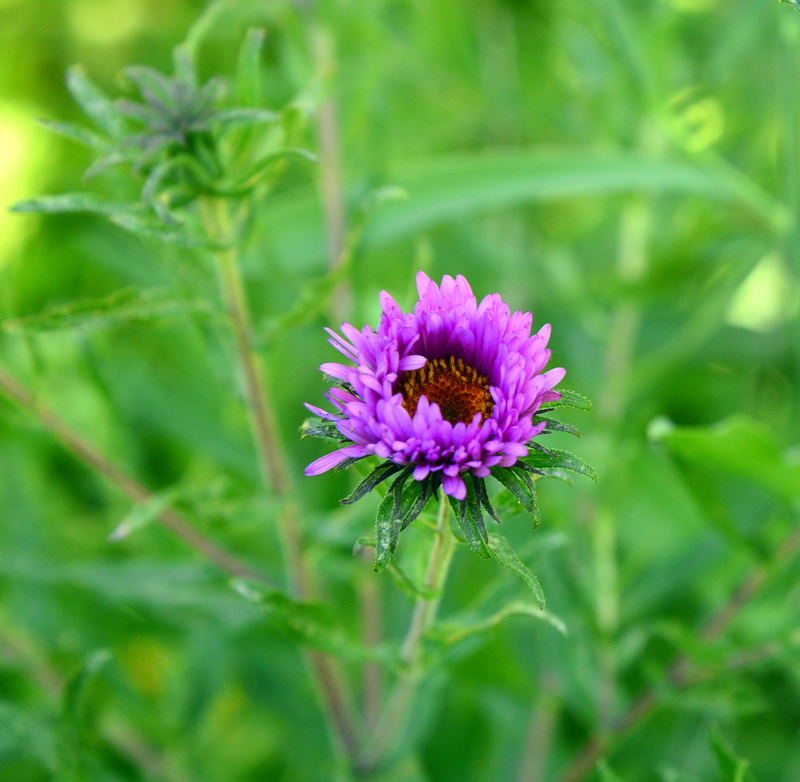 The first New England asters (Aster novae-angliae) opened about 10 days ago. Flowers are smaller and sparser than usual this year because of the dry weather (this garden is never watered). Compare this photo to the one at the bottom of the post. Last night’s rain didn’t do much: my rain gauge registers not quite half an inch of precipitation. Several waves of storms moved through, so the amount of rain would vary greatly in different locations. I hope you got more than I did! As you can see from the photo above, some fall flowers are later, smaller, and sparser than usual. The drought seems to be affecting the asters in particular; the Rudbeckias, Eupatoriums, Phlox, and, of course, the grasses, are all doing fine. And the early flowering perennials, like the milkweeds, are ripening their seeds right on schedule: this time of year I try to collect seeds every day. 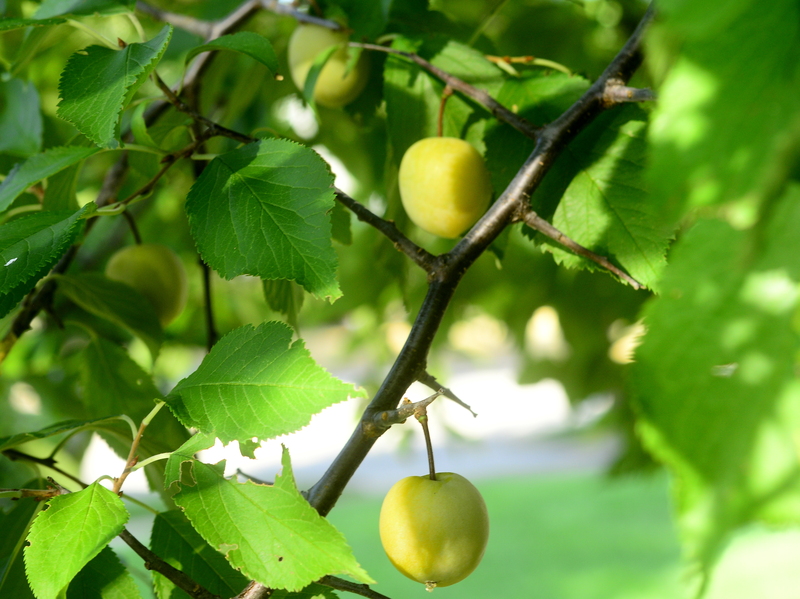 Fruit crops—dogwood shrubs, elderberries, viburnum berries, and plums–were all normal despite the drought. This week the native plums ripened. I got a few; the rest disappeared immediately. They’re tart and delicious. — water new plantings: newly installed plants and annuals, like vegetables, need watering. Any week in which we receive less than an inch of rain, water all woody plants installed this spring or last season. Perennials planted last spring should be well-established, but those planted last fall and this spring need supplemental watering during dry spells, particularly when the weather is as hot as it was this past week. How do you know when we’ve received an inch of rain? An old yogurt container placed on the ground among the plants makes a great rain gauge. A tunafish or catfood can works equally well. — practice good horticulture with warm-season crops such as tomatoes, peppers, squash, eggplant, beans, corn, and cucumbers: Monitor for insect eggs and larvae and remove pests before infestations become serious. Throw out badly infested or diseased plants to prevent the spread of disease (do not compost diseased or infested plant material). Cucumber vines are showing signs of wilt: remove them immediately to prevent the spread of this fungal disease. Pick frequently: smaller vegetables taste better. — As tomatoes ripen their fruit, cut back on watering to avoid split fruits. Keep removing suckers all summer long. At this time of year particularly signs of various fungal diseases appear. Look at this post, this one, and this one for basic information about growing tomatoes. — Plant the fall vegetable garden: second crops of cool-season plants like peas, lettuce, and spinach can seeded directly in the garden in August. But be sure to keep them well watered, especially as they begin to germinate. It’s about 8 weeks until our average first frost date! — it’s not too late to extend a garden bed or start a new one, and it’s always a great idea to eliminate some lawn: spread a 3-4 inch layer of cedar or hemlock bark mulch over the area to kill the grass. In the fall, you’ll be able to plant right through the dying grass and mulch. I mulched an area of lawn about a month ago and am scattering perennials seeds there as they ripen. — this is a good time to prune woody plants. Once all growth, flowering, and fruiting are done, the plants are relatively, but not completely, dormant, giving you a window of time to prune before they get ready for their next critical task: leaf abscission (shutting down for the winter). I do most of my pruning in winter, but I also prune back shrubs as needed after they have ripened their fruit. — follow a sustainable lawn care regimen: if you feel you must fertilize your lawn, best practice is to give it no more than two applications of slow-release organic fertilizer each season, around Memorial Day and Labor Day. It’s too early now to reseed bare areas: wait until early fall. (Better still, if you have a place where grass won’t grow, plant something that will, like shade-loving native perennials.) Let the grass grow at least 3″ tall for maximum photosynthesis. Lawns do not need water now (or ever), but if you do water, do it infrequently and deeply to encourage deep root growth. One inch of water once a week is much better than a few minutes each day (watering every day is likely to cause fungal diseases). But remember: the more you water, the more you’ll have to mow! If you follow my advice and hold off on watering entirely, your lawn is dormant now, but it will green up as soon as we get some rain. And if you don’t feel like doing anything but planning for next year’s garden, take a look at my most recent column in the North Jersey newspapers. Enjoy the garden this week! The same aster two years ago, in a year with more normal rainfall. My favorite Rudbeckia, R. triloba, is almost unbelievably floriferous. It won’t let up until frost. The weather is about to turn hot: starting tomorrow, we’re due for almost a week of 90-degree days. By all indications, the relatively cool weather we’ve enjoyed for the past two years, with pleasant summers and cold, snowy winters, is ending. A strong El Nino in the Pacific means heavy rain for the western United States; for us, it means above-normal temperatures and below-normal precipitation over the next few months. If you followed my advice and planted a fall vegetable garden, be sure to water carefully. Germinating seeds are particularly vulnerable to heat and lack of water. This is one circumstance in which is makes sense to water frequently and somewhat shallowly: while seeds are germinating, they need to stay moist. — water new plantings: newly installed plants and annuals, like vegetables, need watering. Any week in which we receive less than an inch of rain, water all woody plants installed this spring or last season. Perennials planted last spring should be well-established, but those planted last fall and this spring need supplemental watering during dry spells. How do you know when we’ve received an inch of rain? An old yogurt container placed on the ground among the plants makes a great rain gauge. A tunafish or catfood can works equally well. — practice good horticulture with warm-season crops such as tomatoes, peppers, squash, eggplant, beans, corn, and cucumbers: Monitor for insect eggs and larvae and remove them before infestations become serious. Throw out badly infested or diseased plants to prevent the spread of disease (do not compost diseased or infested plant material). Cucumber vines are showing signs of wilt: remove them immediately to prevent the spread of this fungal disease. Pick frequently: smaller vegetables taste better. — As tomatoes ripen their fruit, cut back on watering to avoid split fruits. Keep removing suckers all summer long. Look at this post, this one, and this one for basic information about growing tomatoes. — Plant the fall vegetable garden: second crops of cool-season plants like peas, lettuce, and spinach can seeded directly in the garden in August. But be sure to keep them well watered, especially as they begin to germinate. Stay cool and enjoy the garden this week! American plum trees (Prunus americana) are ripening their fruit. This picture was taken 5 days ago; today the plums are a rosy orange color. They’ll be ripe in a day or so, and there are so many this year that we may actually get some. The lawn on the left has been allowed to go dormant, which is what lawns naturally do in August. It will green up as soon as it rains. The lawn on the right has been kept artificially green through continual watering. Our situation can’t be compared with that of the western United States, but we are nonetheless experiencing a drought. April, May, and July were unusually dry, although we got a nice break in June, and temperatures have been higher than we’ve seen in a couple of years. 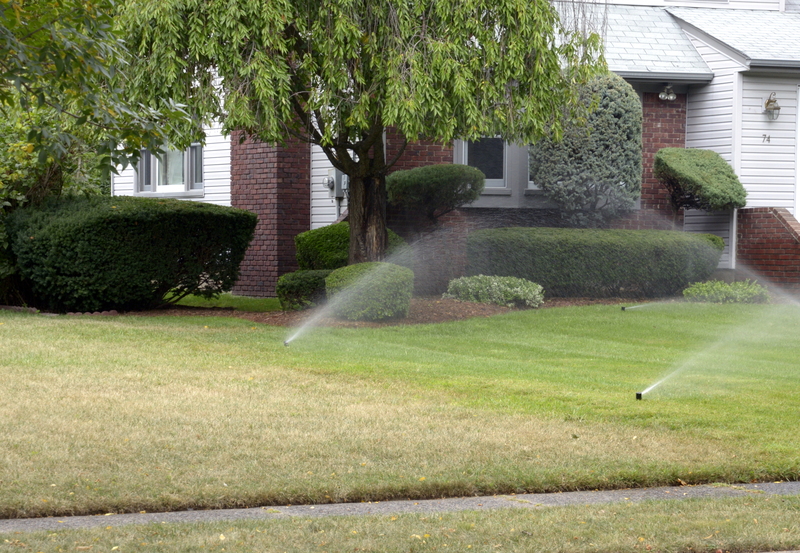 Ridgewood Water has just imposed Stage II water restrictions, which means that homeowners who get their water from that company can water only two days per week (Tuesdays and Saturdays for properties with odd-numbered addresses, and Wednesdays and Sundays for properties with even-numbered addresses). As a result of the drought, many plants are water stressed, and it’s easy to observe the different ways that various plant react. Large trees have such extensive root systems that they will suffer little permanent damage, but many have set seed unusually early (notice the heavy crops of maple seeds and acorns on the ground this early in the season). Many smaller trees and large shrubs will do fine as well, although they may show a little stress: leaves looking a bit droopy, a few leaves changing color early or dropping, smaller flower clusters. Perennials, if they are well established and properly sited, should be fine. The problem is plants that are not yet well established or that were sited incorrectly. Let’s consider each of those situations. When you move a plant, it takes more time than you may realize to become established, or completely acclimated, in a new site. The bigger the plant, the more time it needs. 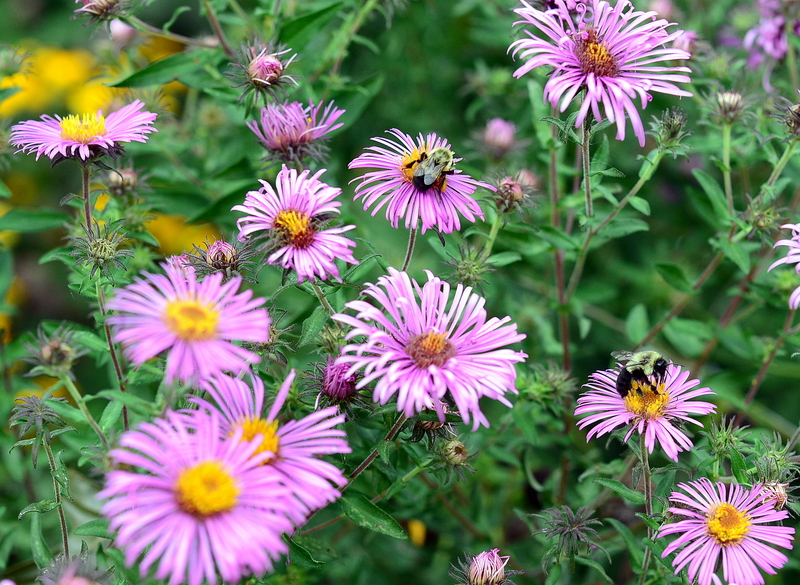 A large perennial will probably need an entire growing season, a very small plant may be established within weeks, a shrub will take at least a year, a large tree will take several years. And for all that time, the plant needs supplemental watering during dry periods to help it produce new roots that reach far into the soil in its new home. There’s a simple rule for determining how much water a plant needs. For the entire growing season, the plant needs at least 1 inch of water per week over its entire root system, either from precipitation or from supplemental watering. So if there’s half an inch of rain that week, give it half an inch more. If there’s 1 1/2 inches of rainfall, don’t water at all. If the weather is very hot, it can’t hurt to give it a total of 1 1/2 to 2 inches. In hot weather, more moisture evaporates from the soil. How do you know how much precipitation you’ve received or how much water you’ve given? You place some sort of container–a cat food or tuna can, a yogurt container, any kind of container–on the ground among the plants, and you leave it there. After a rain or after watering, you measure the amount of water in the container. Once you’ve watered a few times, you’ll know how long it takes to deliver an inch of water with your sprinkler system or hose and sprinkler. I bet it’s longer than you expected. Most people do not water deeply enough, especially those who use automatic sprinkler systems. Watering for 7 to 12 minutes per day, either every day or every other day, is very shallow watering. Shallow watering results in shallow root systems: the plants never develop deep, strong, healthy root systems that can help them withstand difficult conditions. Frequent shallow watering also encourages the growth of disease-causing fungus, especially water applied in the evening. On the other hand, deep watering just once a week encourages plants to develop deep root systems. Water deeply, and water early in the day. Note that I’m concerned only with newly installed perennials, shrubs, and trees, not with established plants or lawns. Neither should ever require watering. Lawns naturally go dormant during hot, dry weather and green up as soon as it rains. Established plants have extensive root systems that allow them to mine the soil for every available molecule of water. Established plants that wilt during dry weather to the point that they require regular watering present a different problem. These are plants that were planted in the wrong place: for example, shade plants placed in full sun or wetland plants placed in dry soil. These plants will need supplemental watering pretty much forever. To avoid this problem, do some research before you plant, and put the right plant in the right place. 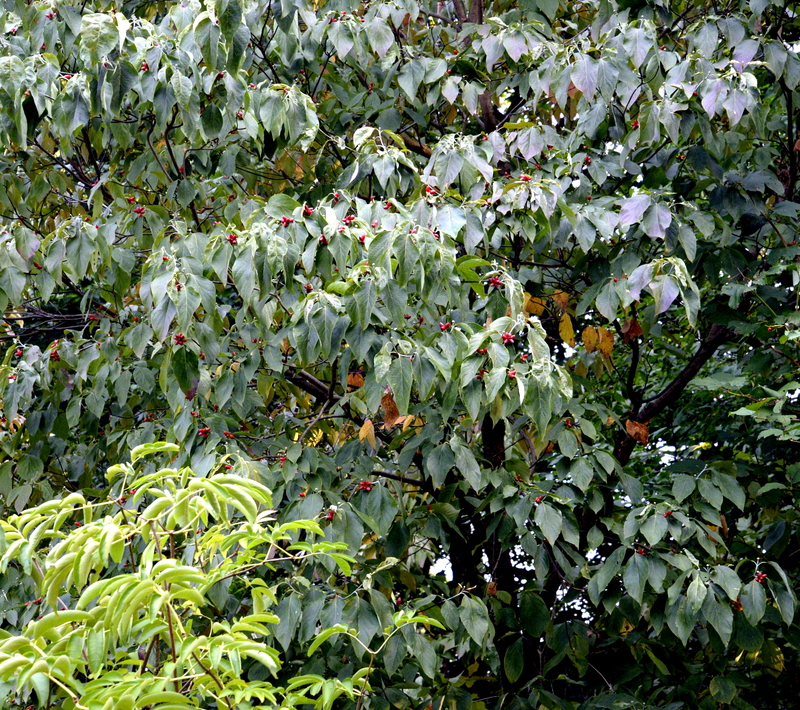 A healthy flowering dogwood (Cornus florida) full of bright red fruits in early fall. This tree was planted on the north side of taller trees that shade it from direct sun. Flowering dogwoods always grow in shade in nature, but most people make the mistake of planting them in full sun, which causes chronic stress, often leads to disease, and shortens their lives. These pictures show two individuals of the same species. 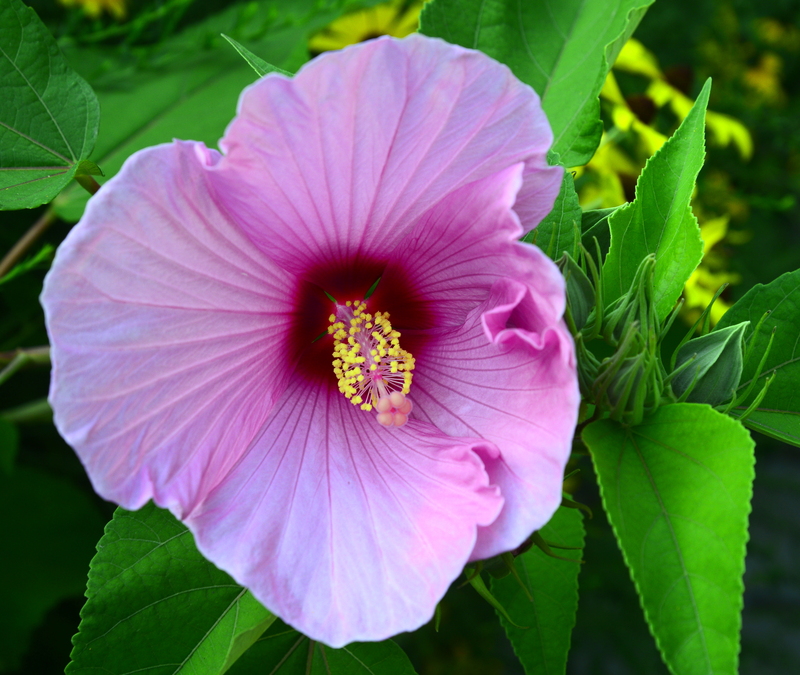 Hibiscus moscheutos is a beautiful, carefree, native perennial that self seeds readily and pops up in both color forms in my garden year after year. The plants are about 4 to 5 feet tall, and the pink flowers are as large as dinner plates (the red-eyed white ones are about 6″ across). Each flower blooms for only one day, but notice all the buds in the top picture. The spectacle goes on for several weeks, to the delight of pollinators. In the fall, there will be large brown seed capsules filled with BB-shaped black seeds. I try to collect them, but the birds always get most of them. This is a great back-of-the-border plant. 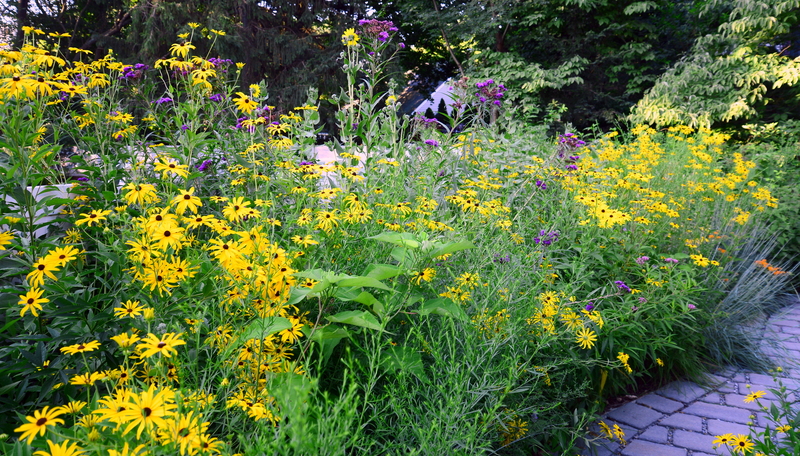 I grow it along with ironweed, a tall Rudbeckia, red milkweed, and perennial sunflowers. The guidebooks all say that it’s a marsh plant, but it does great in my very dry, sandy soil. All it needs is sun. Give it a try next year! Summer exuberance: certainly you could design a more formal garden using native plants, but I like a more natural look (some would call it messy). This border includes perennial sunflowers (Helanthus mollis), Rudbeckia subtomentosa, Hibiscus moscheutos (large leaves, not quite in bloom yet), a volunteer aster that’s not in bloom yet, little bluestem grass, tall purple ironweed (Vernonia fasciculata), and orange butterfly weed (Asclepias tuberosa, second-year seedlings blooming late), among many other species. The summer garden is at its height right now: the birds are finishing off the elderberries and grey dogwood fruits and starting to eat the ripe pokeweed berries. Yes, pokeweed is large and weedy, and poisonous, but I leave one or two plants in hidden corners of the garden. The birds adore it. Native plums are ripening, and the crop is large enough that we may get some this year. The squirrels made quick work of the hazelnuts: one day the shrubs were heavy with nuts, the next morning there were piles of shells on the ground. And the flowers! The more I cut and bring inside, the more there seem to be. And many of these plants, especially the Rudbeckias, will continue to bloom until frost. The photo above shows just a few of the native perennials in bloom right now. The pollinator activity is enormous and unceasing: bees, wasps, and butterflies are around all day, and moths take over at night. The birds eat the insects, and they will soon be eating the seeds. Goldfinches have made their yearly appearance. We’ve had very little rain in the last month: my garden received less than half an inch last week and this week, despite storm systems passing through. 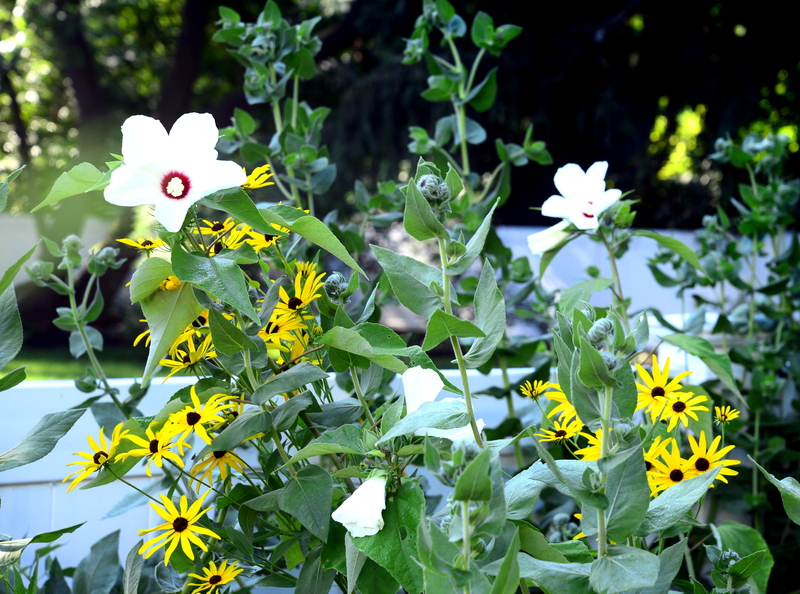 But the heat wave has moderated to some extent, and the plants are looking happier. If you’re growing tomatoes, they’re probably setting fruit again; they stop when the temperature rises much over 90 degrees. — Plan the fall vegetable garden: second crops of cool-season plants like peas, lettuce, and spinach can seeded directly in the garden in August. — follow a sustainable lawn care regimen: if you feel you must fertilize your lawn, best practice is to give it no more than two applications of slow-release organic fertilizer each season, around Memorial Day and Labor Day. It’s too late now to reseed bare areas: wait until early fall. (Better still, if you have a place where grass won’t grow, plant something that will, like shade-loving native perennials.) Let the grass grow at least 3″ tall for maximum photosynthesis. Lawns do not need water now (or ever), but if you do water, do it infrequently and deeply to encourage deep root growth. One inch of water once a week is much better than a few minutes each day (watering every day is likely to cause fungal diseases). But remember: the more you water, the more you’ll have to mow! If you follow my advice and hold off on watering entirely, your lawn is dormant now, but it will green up as soon as we get some rain. Aren’t these flowers adorable? 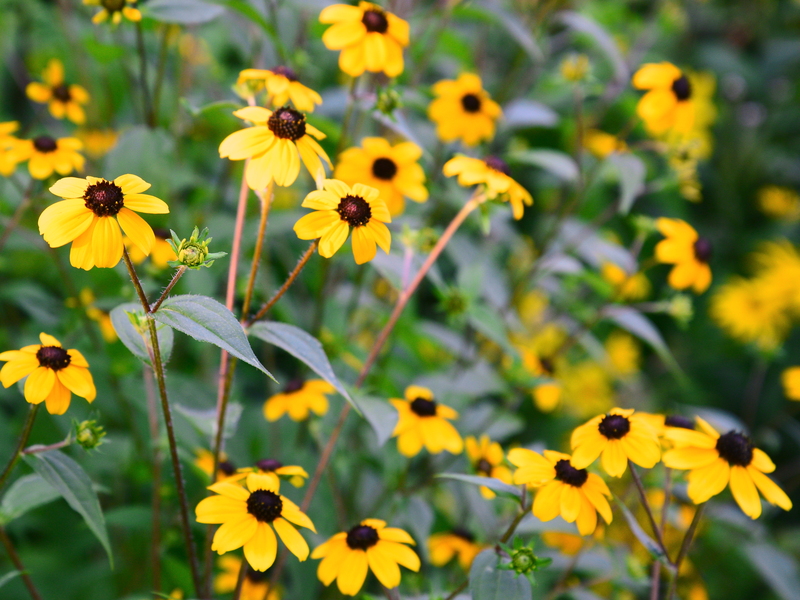 This is Rudbeckia triloba, a wonderful plant, easy to grow and a great size for the middle of the border.